As of 2003/12/25 sony's vaio u-series are one of the smallest complete laptops on the market (unfortunately was only available in the japanese market). Much like its bigger brother the picturebook c1 series, the u1 has no internal removable media. If you shelled out the extra cash for the bootable floppy or cd/dvd drive, then installing a new os is mostly straightfowrard. PCG-U101: The first of the second generation U-Series, Completely different hardware. As you can see, the U1 and the U3 are basically the same machine in different color cases and with minor changes. As such, the following information from my U1 should work exactly the same on a U3. Other U-Series users are welcome to let me know how things work on their models. 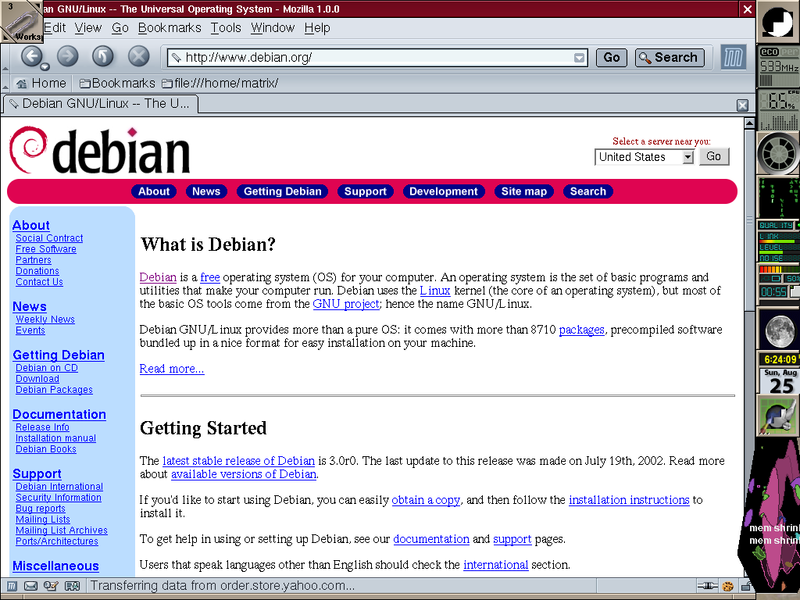 This page was originally focused on installing Debian over the network via PXE. I've moved all that to it's own page Netbooting the U1which will hopefully get you up and running in no time. This should also be useful if you find yourself with a completely unbootable system. I recommend running a 2.6.x kernel. Stock 2.6.0 does not require any patches to work with the U1. Early -test releases did not support the Zoom and ThumbPhrase buttons due to a change in the sonypi driver. I went down to the local craft store and bought a pack of 1/2" round Velcro tabs. They come with and without glue on the back, I recommend getting them without as the adhesive they come with is very messy and will probably not hold well. A roll of thin 1/2"
3M brand double sided tape is what I use to affix the tabs directly over the rubber Mouse/Pointer Caps. This works great as both a preventative method to keep your caps in good shape as well as rejuvinating old worn-out caps. Change the double sided tape every few weeks for best responsiveness results. Originally i was using a bit of heavy clear plastic and some thread, and i put together a little protective slip cover for the caps. These worked well and prevented damage to the rubber. But they were useless on already worn out caps and would break when i least expected. Then I moved on to cutting out circles of velcro tape. The stiff backing of the velcro, along with the traction provided by the hook-side was a great plus. I could carry a few rounds in case of emergency, and even better, allowed me to use my worn out caps as if they were new. Personally, I recommend you do this, there doesn't seem to be any ready source for replacement caps, and fighting with the pointer isn't worth the pocket change in materials and time involved in making the covers. I use a fairly modified version of sjog-0.5 to control the jogdial and extra buttons on the Vaio U1. Because of the way I use the jogdail under linux, these changes may not work out for everyone. None of the patching that used to be necessary is needed anymore. 2.6.0 supports everything out of the box. Most of the packages in testing and unstable are already using the new acpi interface and life is good. the debian acpid package includes Joey Hess's example ac power event handler in /usr/share/doc/acpid/examples/. he uses a picturebook, so it's all set to use vaio bits and just need to be edited to taste of power conservation. you can find this here if you're not a debian user. So far I haven't had much luck successfully suspending and resuming with the stock 2.6.0 code. It appears to be problems with the ACPI interfaces and the Vaio's ACPI. I use the SWSuspend2 code (currently using -rc3) and everything works perfectly with the new hibernate script also on the sourceforge page. The only problem I've encountered so far is that I cannot resume to X11 when XFree86 is running with hardware acceleration. I have hibernation setup through acpid, so hitting the power button calls the hibernation script instead of init 0.
the stock sjog uses system() to launch programs from the menus. what ends up happening is the spawned applications keep /dev/sonypi open for no reason, and removing the module while these programs are running is impossible. with sonypi compiled in, you don't have to kill sjog (see above), which means you don't have top worry about running sjog as the correct user upon resume. Of course, you currently have to choose between 3D acceleration and being able to suspend to disk. I haven't looked into this enough to even guess what's choking. At some point I'll need to try the more recent DRI drivers. There are fortunately no special tricks involved here. The 2.6.0 kernel radeon drivers will JustWork without any patching or configuration. If you run Debian, you will probably need to be running XFree86 4.3.x currently available in experimental as it has support for PCIMode Radeons (I don't think the 4.2.x packages did ). Where ForcePCIMode will make sure XFree86 will enable DRM via PCIGART and EnablePageFlip I picked up as a performance tip from somewhere. would be nice to get the usbvision drivers working.